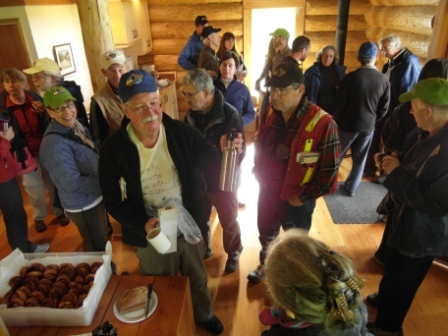 A successful second Metchosin BioBlitz took place on May 4 and 5, 2012. The weather co-operated and more than 50 invited specialists found a wealth of local species, many that were not found during the 2011 BioBlitz. At Metchosin's first BioBlitz, the taxonomic specialists found 850 different species. (Use the "BioBlitz Results" tab on the left to read the 2011 report.) This year the experts found even more species in Metchosin's lands and waters -- almost 950 of them. The 2011 and 2012 BioBlitzes have now documented over 1200 unique species that share living space with the human residents of Metchosin. Metchosin's 2012 Bioblitz began Friday night (May 4, 7:00 pm) at the Metchosin District Office Council Chambers. 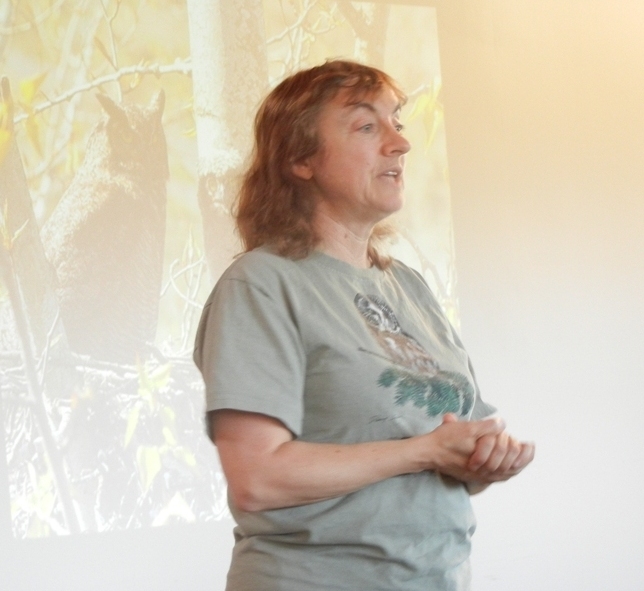 This family event featured a slide talk about the 2011 BioBlitz by Andy MacKinnon and a presentation on owls by Ann Nightingale ("Hurried Hoots - A Short Primer on Local Owls"). Following the talks Ann led a group on an owling expedition. Early on Saturday morning birding groups fanned out across the district to spy on the dawn chorus. Ann Nightingale, after only a few hours sleep, pulled herself out of bed to co-ordinate the search. By the end of the day birders had identified 99 different avian species. At 8:30 am specialists in plants, lichen, fungi, marine organisms, insects, spiders, slugs, reptiles, fish, amphibians, and mammals began to arrive at the Mel Cooper cabin of the Metchosin Boys and Girls Club. Waiting for them at the cabin was hot coffee/tea and warm sticky buns (supplied by Martha Haylor). They picked up their gifts of BioBlitz hats, CRD water bottles, and a buildable wooden models of a horse or flying pig crafted by Metchosin's own Derek Wulff. See pictures of the 2012 Metchosin BioBlitz experts at work. Members of the public soon arrived to join the experts. People packed up their gear and prepared to inventory the species of Metchosin. With Andy MacKinnon's help (and loud voice) the attendees were soon organized into groups to foray (1) Camosun College's Van der Meer Reserve, (2) Pearson College waterfront, (3) the beach areas from Weir's Beach to Witty's Lagoon, (4) DND's Mary Hill, and (5) the Boys and Girls Club property. Marine experts volunteered to connect up with a CRD beach seine, a family program at Witty's Lagoon. Three hours later the groups reconvened at the Mel Cooper cabin to enjoy soups prepared by Councillor Jo Mitchell and pizza donated by My-Chosen Pizza. At 1:00 pm the experts and members of the public reformed themselves into teams and headed out to new locations. One group of 17 went to Camp Thunderbird. Another team surveyed Blinkhorn Nature Park and Mount Blinkhorn. A third visited Tower Point. Two experts arranged to meet up with a second CRD family program, a nature walk at Witty's Lagoon. At the end of the afternoon forays, BioBlitz experts went home to compile lists of what they had seen. In addition to the species summary (link at right), you can view the full list of species found on the forays of the 2012 Metchosin BioBlitz listed alphabetically by scientific name or listed by species group. The authorities against which the scientific names have been verified can be found here. (Certain small spelling errors were in the 2012 lists -- they have been corrected in later lists). View the results of the 2012 Metchosin BioBlitz. At BioBlitz 2012 Hans Roemer led a team to the Mary Hill DND lands. One member of the team, Libby Avis, recorded a sighting of the Red-legged Frog, Rana aurora. This amphibian is an endangered (blue-listed) species in BC. It lives in quiet ponds and lakes and seldom ventures far from the water. In recent years the spread of the invasive bullfrog has raised concerns about the viability of our Red-legged frog population. Bullfrogs occupy the habitat of our elusive Rana aurora and may even lunch on them. The District of Metchosin has allocated money in recent years to help control local bullfrog populations. 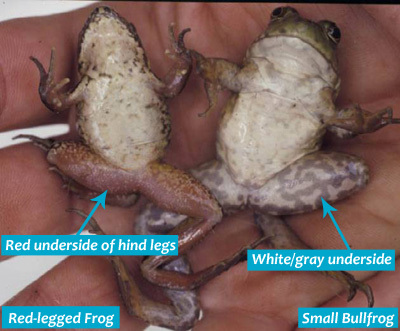 A page at the UVic Bullfrog project shows how to tell these two frogs apart when seen from below (image at right). The Red-legged frog also has raised ridges on its back that are lighter-coloured than the rest of the skin. A pair of rare mosses turned up at the 2012 BioBlitz. 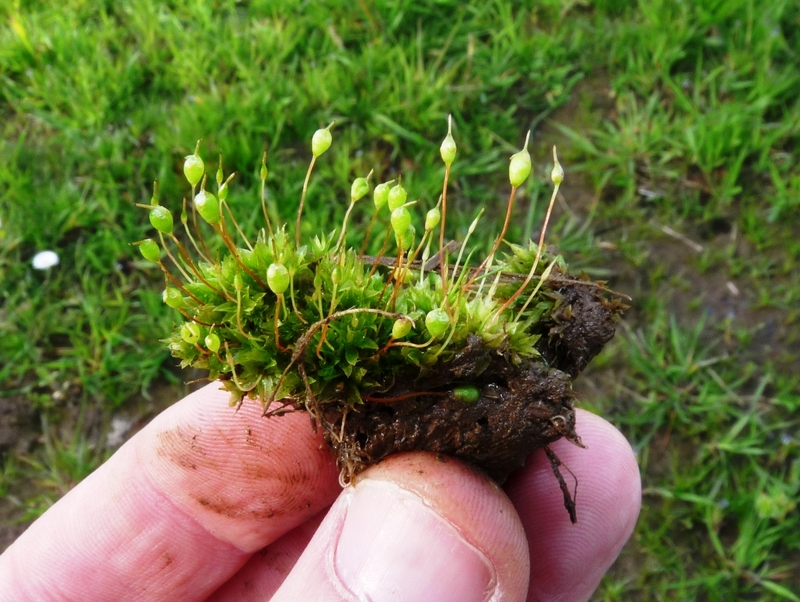 During the Mary Hill foray Gerry Ansell honed in on a known-but-rarely-seen population of Rigid Apple Moss, Bartramia stricta. This red-listed moss has only been found on Vancouver Island in two places: on Mary Hill and at a Nanaimo location. 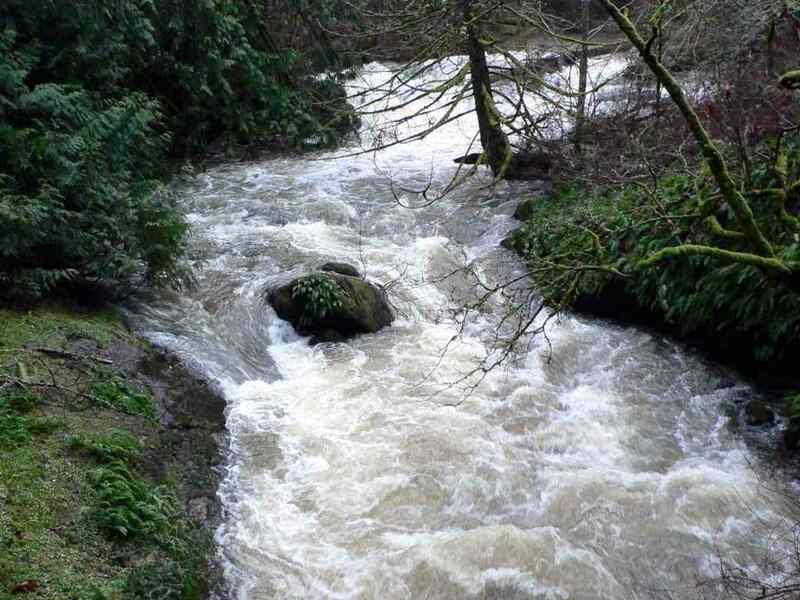 It has been put at risk by the destruction of wide swaths of its Garry Oak habitat. 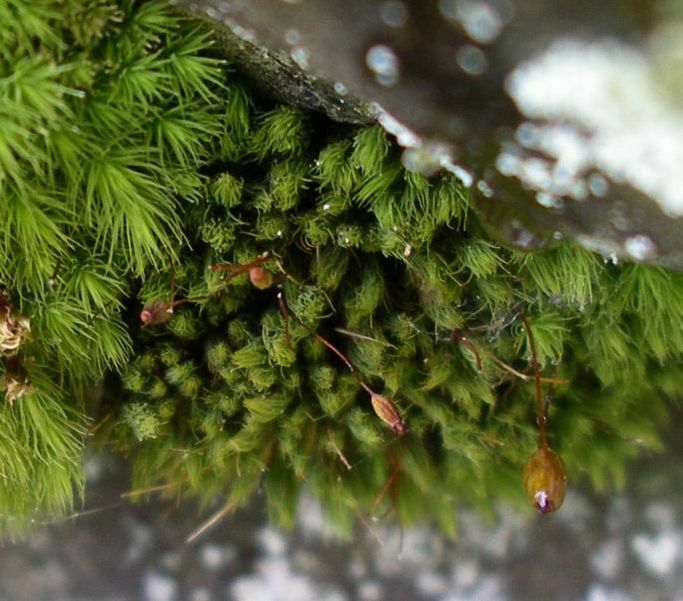 As you can see from Gerry's picture (top), the sporophytes are globular, leading to the designation of the species as "apple moss." Jamie Fenneman found a second rare (BC blue-listed) moss in the field near the Boys and Girls club Mel Cooper cabin. Physcomitrium pyriforme, Common Bladder Moss, has beautiful, urn-like capsules, as you can see in Jamie's picture (bottom). The moss prefers exposed, wet soils. 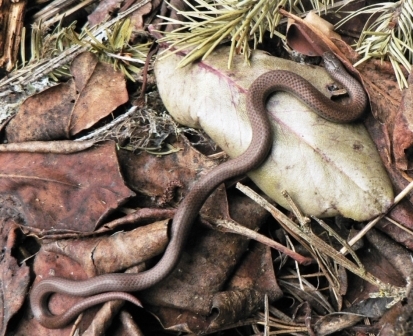 At this BioBlitz Moralea Milne found one of the many Sharp-tailed snakes that live on her Camas Hill home. She was lucky -- March and early April are better times to look. Sharp-tailed snakes are small, seldom reaching 30 cm in length. Endemic to California, Oregon, Washington, and BC, they are known from only a few Vancouver Island sites. As you can see from Moralea's photo, the snake has an oddly stub-pointed tail. Among the rare plants found by BioBlitz experts was a member of the genus Sanicula. 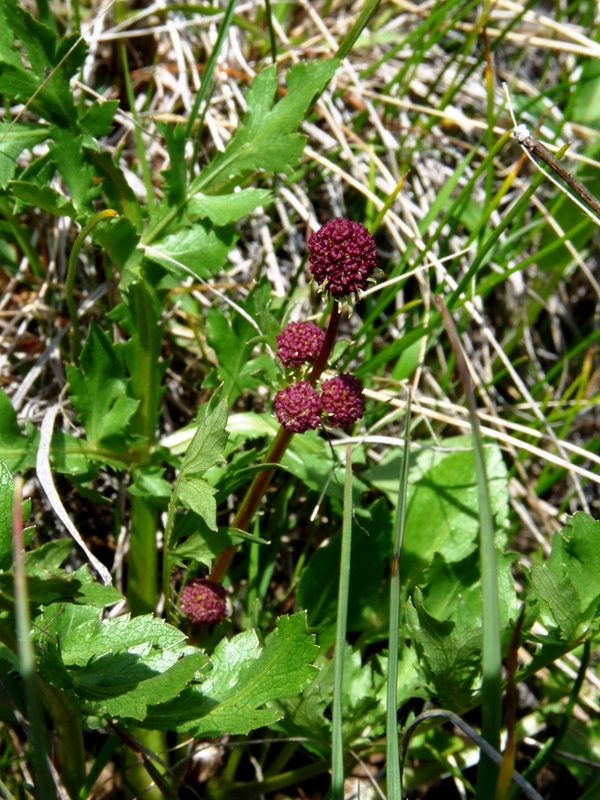 The Sanicles are members of the larger carrot family of plants. The most common Sanicle in our area is Pacific Sanicle, Sanicula crassicaulis. It has a yellow flower cluster and can be found in woods and open areas throughout Metchosin. A red-listed cousin, Purple Sanicle (Sanicula bipinnatifida), occasionally turns up in the same habitat. This plant, as the name suggests, has purple flower heads. Jamie Fenneman found the specimen pictured here at on private property at Leefield Rd. Several of the birds spotted at the second Metchosin BioBlitz have been designated as endangered species. These at risk species include the three BC cormorants, all three of which were seen by the birders on BioBlitz day. 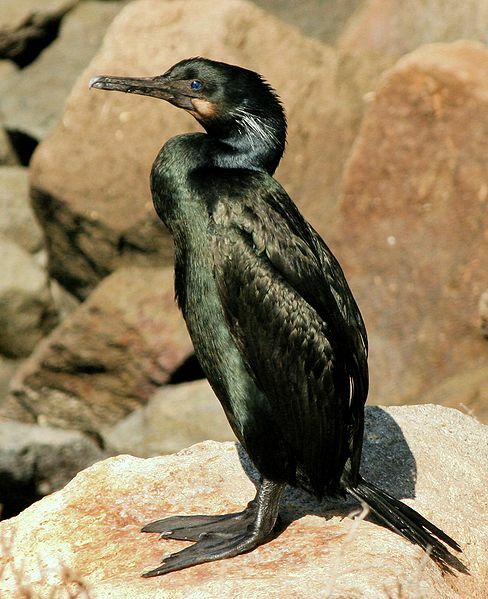 The two marine species of these birds, Brandt's Cormorant (Phalacrocorax penicillatus, top picture) and the Pelagic Cormorant (Phalacrocorax pelagicus pelagicus, bottom picture), have been given a red rating, flagging the highest level of provincial concern. The Brandt's Cormorant is larger and more gregarious than the Pelagic. It has black plumage with a pale throat "chinstrap" and sports a blue chin flap in mating season. The smaller Pelagic has a "broomstick" neck and white on its flanks in mating season. 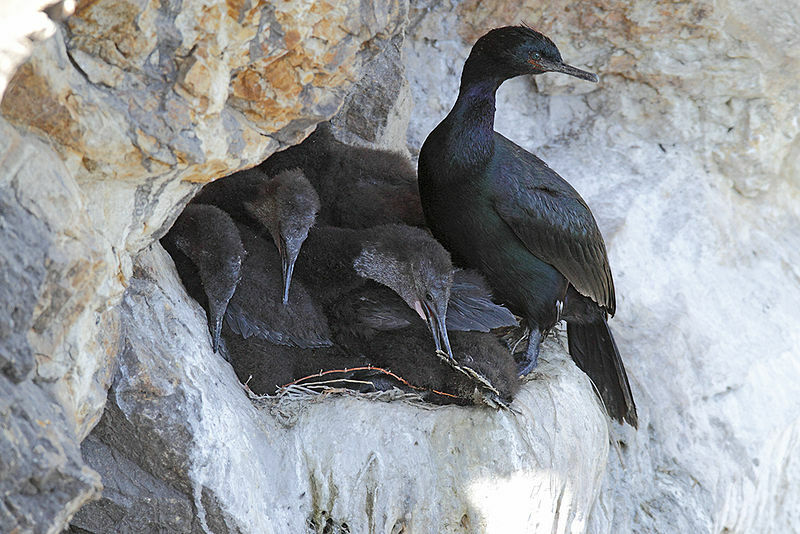 Both nest on Vancouver Island, the Brandt's typically on the west side of Vancouver Island, the Pelagic along the Strait. The Metchosin Biodiversity Project acknowledges the many people and organizations who made the 2012 BioBlitz possible. Our partners include the Metchosin Foundation, CRD Parks, the Victoria Natural History Society, CRD Water, the District of Metchosin, Costco, and My Chosen Pizza.